On this page you can see a screenshot of the Pipette. The screenshot is available for the operating systems Windows 10, Windows 7, Windows XP and Linux Ubuntu. You can switch the shown operating system with the links under the screenshot. Just click on the button "Pipette", release the mouse button and move over your screen. The color currently under your cursor is automatically displayed in the color box and at the bottom in various color models. Click again with the mouse, then the current color snaps and is added to the color list, from where it can be re-selected and displayed in all color systems again. 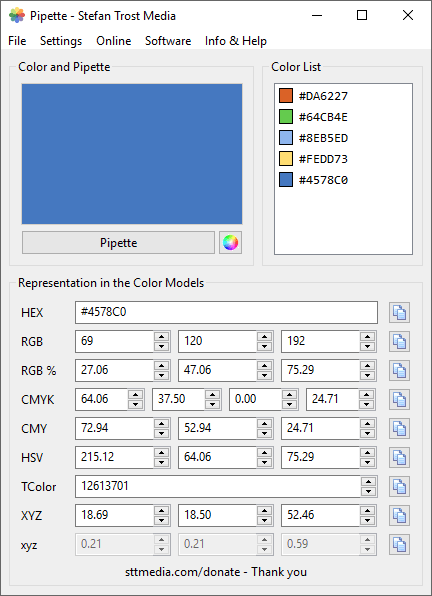 The representation of the color in the different color models can be adapted and changed at any time with the keyboard, the mouse wheel or the up and down buttons next to the corresponding field. In the case of a change, all other values ​​change automatically. The changed color is also automatically displayed in the color field and can be added to the color list by double-clicking. Furthermore, the representation of the values in the different color models can be customized by using the settings in the menu (for example the used decimal places). With the button behind every line of values, you can copy the values to the clipboard.